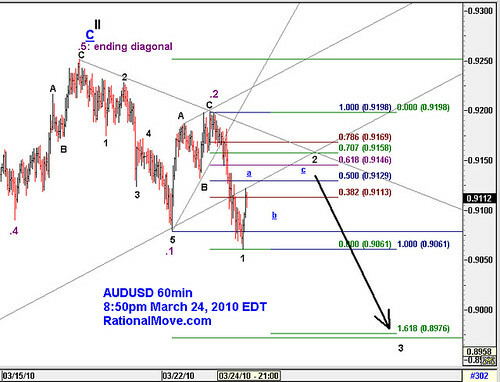 I traded short AUDUSD and EURUSD. I lost on EURUSD, but I weighed much more on AUDUSD that was win, so I made a small profit (0.38%). 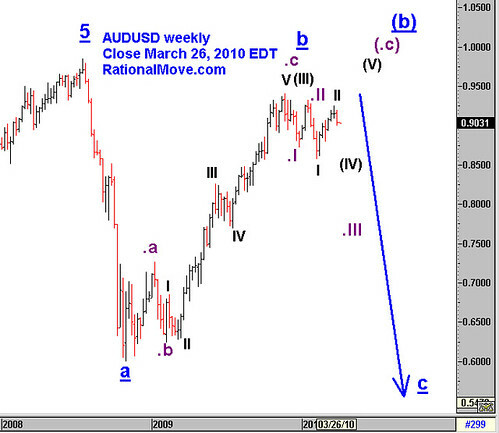 I have to reflect on the bad $AUDUSD selling operation today though. If I kept the pos from 0.9110, I could have made 3.75% return. Now I think it’s time to stop trading for a moment and think about the mid term outlook. 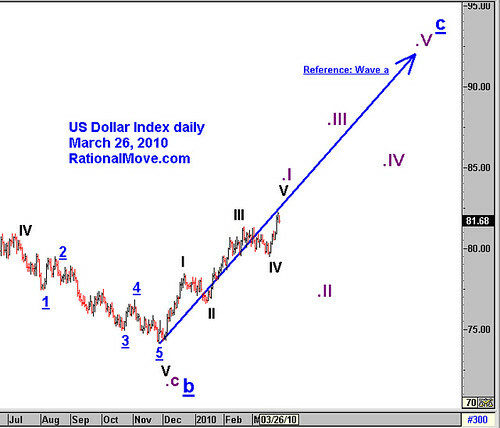 Dollar index. I can clearly count 5 wave structure of an impulse wave from the bottom. Dollar may extend another few days or even a week, but I am expecting a correction towards purple .II from here. The distance purple .I traveled was much farther than I had anticipated. This may mean that the dollar will appreciate so dear in the mid to long term despite the US budget deficit fear? EURUSD 12 hours chart. It may go further down around 1.2800? 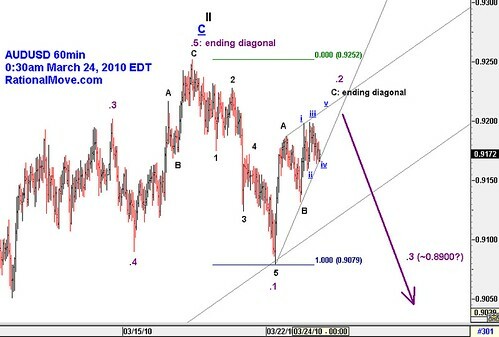 Or 1.3265 (blue underlined 1) was acutally the end of black V and purple .I and EURUSD will be entering the corrective wave up? EURUSD 60min chart. I can clearly count 5 waves down to 1.3265. If it is the blue underlined 1, we should see purple A-B-C upwards to blue underlined 2. 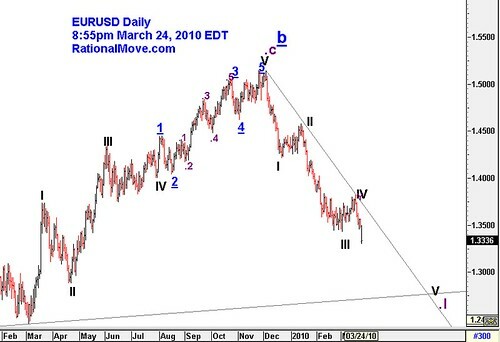 If an impulse wave will appear instead, I would expect a greater rebound of EURUSD towards 1.4000 (or even higher) in coming months! Gold. My last trade (a couple weeks ago) was a loss. 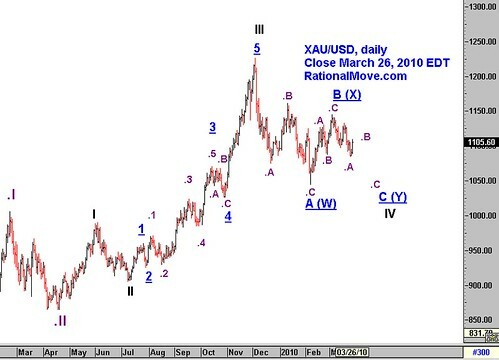 Gold is not quite ready to be launched yet. We may see rebound to $1145 in next weeks, but should be quiet over all. 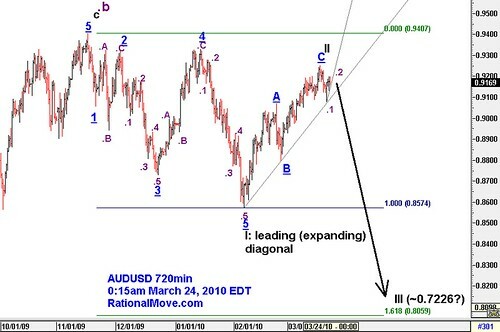 Lastly, AUDUSD. In the mid term, I am still not sure if 0.94 in Nov ’09 was the peak of blue underlined b. I put the secondary scenario with parentheses in this weekly chart. For now, I trade carefully with the first scenario. Now the whole move down from 0.9250 looks like a leading diagonal. 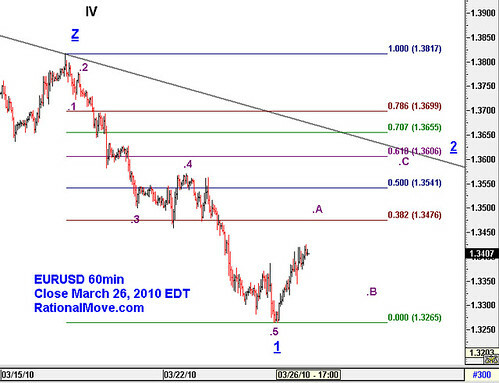 If my count is correct, we should see a very short rebound to 0.9175 before going down to 0.8950. The process most likely non-impulsive. So, it will be difficult to keep one’s faith in the position whether it’s long or short. 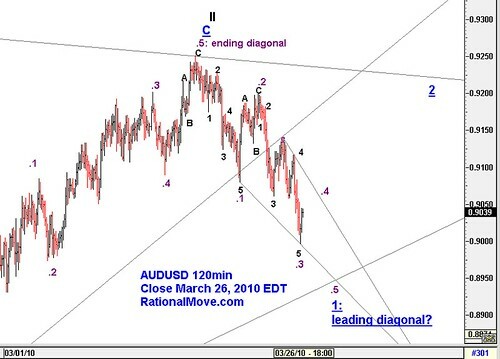 Again, I don’t have much time to write, but I took some profit in selling both AUDUSD and EURUSD (1.7% gain), and now waiting for another (and bigger) selling opportunity for the both dollar crosses. 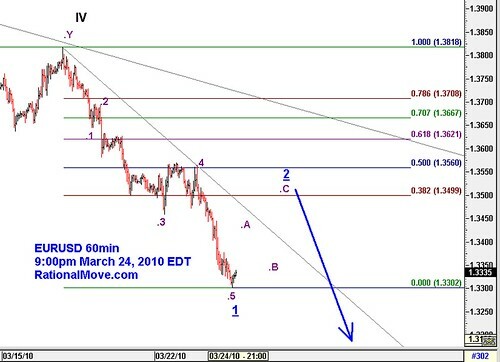 It was a good judgement of today to cover the short around 0.9080. Now rebounding. I will sell after black 2. We should at least have 12 hours to wait. 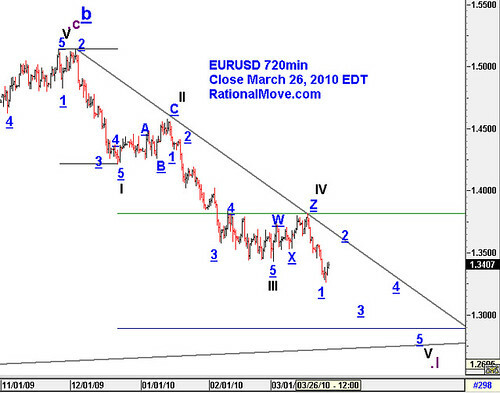 For EURUSD, I made a major modification to my Elliot wave count. This is the daily chart. Now I am waiting for the rebound to blue underlined 2, possibly reaching 1.3500. Blue underlined 1 may not have been over, and it may go further down though. In any case, I am in a waiting mode for EURUSD. Just a quick post only the charts because I need to go to bed. Here is the 1 hour chart. I just set stop sell at 0.9150. Stop loss will be set at the top of blue underlined v (say, 0.9230 for now).